Marmite owner Unilever has bought healthy snack brand Graze, which started life a decade ago as a snack box delivery service. 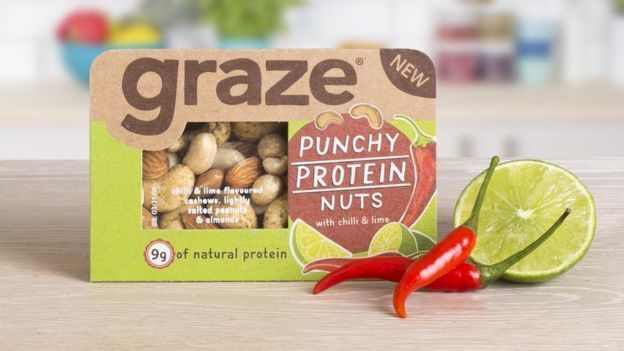 Graze produces nuts, seeds, trail mixes and snack bars, with no artificial ingredients and Unilever said the purchase would accelerate its presence in healthy foods. The sale price was not given, though sources say it was less than £100m. The boss of Graze described the deal as ‘transformational’. Graze products are now available in stores including Sainsbury’s, Boots, WH Smith and Tesco, as well as online and direct to the consumers. Cooper said in the short term Unilever would “likely leave Graze alone”. Commenting on the deal, Simon Walton is head of the consumer practice at Berwick Partners, said: “This deal is yet another example of consumer/FMCG giants taking on challenger brands that can help them diversify, expand, innovate, acquire talent and capitalise on fashionable trends towards healthy snacking and socially-conscious products. “Marking his first deal, new Unilever chief Alan Jope has gained a successful business within the fast-growing healthy snacking category and online food subscription-based market to bolster Unilever’s roster, not to mention a hugely talented Graze management team overnight.